Background: As part of the Education and Social Justice Fellowship, in June 2017 undergraduate student Harshita Nadimpalli interviewed Father Heribert Muller, S.J., director of St. Ignatius of Loyola Secondary School (Escola Secundaria Inácio de Loiola, ESIL) in Tete, Mozambique. ESIL is a Jesuit secondary school that primarily serves disadvantaged rural students. Muller compares ESIL with other schools in the area. He also discusses how the school engages with the local community, leaders, and agriculture. Finally, Muller outlines his perception of social justice within the Jesuit tradition, as well as the impacts of the colonial and civil wars on Mozambique. Can you please state your name and tell me what your role is in this community at ESIL? My name is Fr. Muller, and I am the responsible authority and the director of this school, so the superior of the Jesuit community here at ESIL in Chividzi, Msaladzi, in the province of Tete in Mozambique. Okay, and can you tell me what ESIL is, and what it stands for? ESIL means Escola Secundaria Inácio de Loiola, or Secondary School Ignatius of Loyola, or for short, Loyola School. Since ESIL is a Jesuit school, and you are a Jesuit yourself, can you share with me what you think makes a Jesuit education stand out to you? And how do you think it affects the culture and mindset of the youth because it is a Jesuit school? And if you have personal examples you want to share because you work here, please do. A Jesuit education as I know it personally is an education with passion towards greater consciousness of reality, competence, compassion, and [the desire] to help the student to know him or herself, and to somehow lead out what is in him, to discover himself, to give greater capability [to the student] through a process of learning, reflection, evaluation, and so on. And [helping the student] to become a person that can think and reflect critically and make a contribution to society: a person for others—we often use that [phrase], and I like it a lot because it summarizes a lot. Not just giving [the student] competence and skills, and developing the intellectual self, but to also help the person to insert himself or herself in society and make a positive contribution towards justice and the common good. And so, how do you think this transfers to the children through the Jesuit education system you have in place at ESIL? How specifically does them being here give them these values? It has long been a dream of the Jesuits in Mozambique to have a college. We have a tradition of having a college in Lifidizi, Fonte Boa, but the history of Mozambique was very difficult and colleges and Jesuits were thrown out and the government was taken over. After many years there is a renewed attempt [now] to build up a Jesuit college and institution in a rural place where they don’t have colleges like that. Tsangano is quite a big district, as you know, and there’s only one other school that gets to the university level in Tsangano, and we are now the second. There is a great need for people who want to continue after tenth grade to get to the eleventh and twelfth [grades]. As Jesuits, we are called to really serve the people who are often neglected at the margin of education. To give education here, to insert it in the culture of the Chichewa people is a challenge, but I feel we are on the right track, and I feel it just even in my community and the way we work together, the enthusiasm, and the happiness to be here in ESIL and do that work. The school is very young, only in our second year, and so many things are not yet there. There are power cuts and water problems, but we have the help of many people outside, and we have been taking steps. What are specific things that are part of a Jesuit education that you do at ESIL that maybe other schools, such as the secular government school in Tsangano, don’t do? Here in ESIL the agriculture dimension is very important. It has also to do with social justice. I believe that to give a young person the skills to do agriculture and to have a sense of the environment is also a key aspect we want to develop, to make use of the resources through organic agriculture. We are just at the beginning in many ways, but we try our best to do what we can. If you want to expand the radius for this question besides the other school in Tsangano, and to other schools in Tete or Mozambique that you know about, what are some challenges students face in the local education system? Feel free to include ESIL in that too. One big challenge is the language. The young people and children come from a Chichewa speaking background—not just the language, but also the culture is strong, and they need to open up to Portuguese. We also teach English, as you know. But Portuguese is the language in which all the subjects are taught, so that is a big challenge. We can also sometimes feel a kind of quiet resistance. You’re teaching, but you feel that the children aren’t really getting you when you ask questions and ask for their own participation. So that’s a challenge for the teachers. Another one is to make the school self-sustainable. Right now we have bursaries—we have lots of sponsors from outside—but 10 years on, I wonder how it will be and whether those who go for boarding [at ESIL] will be able to really cover the costs. Right now they pay 10 US dollars per month, which is about 700 meticais, but the real cost would be about 3,000 meticais, or five times the cost. But that’s what we charge right now. And there are quite a number of students for whom it’s already difficult to get the 700 meticais per month. So that is another challenge for the future, to sustain. We are happy that the state of Mozambique pays the salaries of the teachers. It is a big concern taken away from us. And are the other schools ones that have boarding schools? There are only a few—some are private, and they cost a lot, because they need to cover the salaries of the teachers, and there should also be some profit for the owner of the school, so it’s a different category. We are the only school in this district, and I think in the province as well, where we are a community school, meaning the state pays the teachers but we also need to follow certain conditions to make education available for the youngsters who cannot afford it. We can’t become a college that charges so many thousands [of meticais] and leaves out those who can’t afford it. So since one challenge you mentioned was the cost for boarding, what about free public schools that done have a boarding component, where the students could have free education and not have to pay for boarding? I am still new in Mozambique and this area here, so I haven’t really had an insight how the other schools run, but I have heard there are big problems to motivate the teachers. Many teachers do not come to the lessons, or they give marks which do not really correspond to the students’ work and knowledge. So there are great difficulties in many of the secondary schools where parents just pay the matricula or the inscription fees, and that’s it for the whole term. But many teachers do not really comply, and there are many discipline problems as well. We are lucky to have young teachers who know a bit of the Jesuit tradition, since some of them have been in the seminary or started in another career but decided to become teachers. So they have come across education in the Catholic Church and Jesuit institutions. But we are forming that also, and having a young body of teachers is a greater way to inspire them and help them pedagogically, but also to motivate them. Okay, and to connect our discussion about the language challenge with the teachers, all the teachers have to teach in Portuguese? At the other public schools as well? Yes, and all the books are in Portuguese. There are quite a number of professors who come from other areas in Mozambique who do not speak Chichewa. But you also have some Chichewa teachers who, when they come to a kind of difficult situation, they might give some of the explanations in Chichewa, the local language. Based on these challenges that you’ve mentioned, how does ESIL address these challenges? Or how can it address them in the future, since it is still a new school? We have a dream that we would love to introduce the bilingual system, meaning that some lessons can be given in Chichewa and we would also have Chichewa as a subject. The government encourages that, but it needs another teacher or two teachers and it needs also learning material. That is one thing. Another challenge we like to address is the young people leaving the rural area. We want them to appreciate and love their countryside and the possibilities of life through agriculture and hard work, qualified work, and teach them that they can make a living and be of assistance to their parents, and not just leave the villages and disappear…so the agricultural dimension is very strong and we even think and hope that one day we would have a kind of secondary institution, a small agricultural school, where students can come after the tenth class and be trained in agriculture more professionally. So at ESIL, through human formation, we try to address some issues that are happening in the families and in the country, of reconciliation for example, and help the students to make good choices in their life. With the future opening of the new block with seven classrooms, we’ll be able to do all of the teaching in the morning, and the afternoon can be used for all kinds of extracurricular activities. And what is the schedule right now? Right now the schedule is that half of the school has classes in the morning and the other half in the afternoon. So the teachers do not really have time for other activities. How is ESIL engaging with the indigenous communities, beyond helping the students understand the importance of local agricultural practices? Are there other ways you do that? Laissone [Evaristo Matias] has invited some of the local traditional authorities, the village chiefs, [to the school]. We already had one meeting, and we will have another one with representative authorities who will speak to the students and spend half a day with them and try to explain the culture. We try to have cultural events where the students can have their dancing, and they are influenced also by the modern culture, what comes in from other countries and continents, but we want them to be proud of being from the Chichewa clan and group. But we also want to create among them a kind of national consciousness, that we are Mozambicans, and we have different cultural backgrounds. So that is also one of our aims that they appreciate their own culture, and I think we earn some goodwill for trying to do that. Because you are engaging a lot with the local community in this area, how do you think the chiefs, villagers, etc. receive ESIL since it’s still new? What is the reception? There was a dispute about the land issue—whether the border would be the borderline. We invited the local chiefs and authorities, and it was a very good meeting in which about 40 people came, and we allowed them to speak about what they wanted, to actually speak about the historical development of the place we have. ESIL has 28 hectares, so it is quite a big plot surrounded by villages where you have families with many children, and land has become scarce, because they keep dividing the land, so land is a rare commodity. This part where ESIL is now was somehow cut out in the colonial time and it belonged to a Portuguese farmer. When the war started in the 1960s he gave his property to the church, and the church started a mission there about 51 years ago. It was a huge plot, but hardly utilized. So in 2010 or 2011, the bishop allowed the Jesuits to use 28 hectares of the property. But our meeting with the elders was very important because it brought out that there was still some kind of resentment about the way the whole property issue was handled, so we have come to an agreement. So we are now in the process of making a little fence, but we do that together in agreement with the locals, and we also as a college make a commitment to buying their products. So when they have tomatoes, maize, beans, etc., they can come to us without having to go far to town and sell these to us because we always need these in the boarding place. We are also in contact with the local Christian community because they are a part of the parish here, so our aim is really to go into that network of relationships that already exists. We also give quite a bit of work to people. We are still doing a lot of construction, so we have about 20 workers who receive a salary and are happy that they can make a bit of income. ESIL is connected to Satemwa, the agricultural mission, and also to the orphanages—what was the name of the orphanage network again? Seeds for Tomorrow (Sementes da Manhã). There is a link we have here [between ESIL and the orphanages]. I think 11 of the orphans are here with us at the school. And what is the connection between all three of these institutions? Satemwa produces a lot of food so we get quite a bit of vegetables from them. We help each other with machinery. Sometimes they need something from here or we need the tractor, or they help us with the lorry transport. It’s the same kind of initiative, especially the agricultural training outlook. Many of the parents of our students were trained as agriculturalists in Satemwa. So Satemwa doesn’t have any students, it’s not a school, but it is adults who work and are trained there? Workshops, they have workshops for the parents there. Not just parents, but also others. It’s a way to reach out to both generations and help them with new agricultural methods and improve the seeds and the soil and so on. I am a newcomer to the whole thing and getting more of an appreciation for it. Help to the orphans is important; we want to give support from all sides. So we have Christian communities, and many of them are related to agriculture, but we help our agricultural associations. There are about 30 groups of them who regularly correspond with Satemwa, and there the question of religion doesn’t come in. Whatever religion people are, they can participate in it. Can you give me more of a summary about the orphanages you mentioned? They are six houses, and each has about 10 to 12 children and one or two “mothers” responsible for one house. The children are not necessarily abandoned children, but maybe they lost a mother, and the father was just overwhelmed. So they know their family and where they come from usually; it’s just that the family didn’t have the means to provide for them and give them the care they needed. So each child has a different situation. So we try to keep the care for them, not to take away the care from their community. The community should say, “These are our children,” but we can provide a support network for them. Let’s say it’s firewood or school fees, or whenever money is needed because it’s difficult for the community to provide that. The community can come in [to help] with maize at times, but when it comes to money or payment, often it is difficult. The mothers in charge of the orphanage houses also receive a salary. Can you define what social justice means to you as a Jesuit? For me social justice is very much related to the term of the kingdom of God. It’s a religious term. Social justice is the state where each one finds a network of relationships with others, finds great happiness, satisfaction, and fulfillment. Where there is social justice there is always a movement towards peace, well-being, and comfort; the common good is respected and each one cares for it, a mutual concern, so that people can develop their talents and gifts to the greatest degree. So these broad concepts of education, social justice, religion that we’ve discussed are all important to the community building here. Which of them do you think is most important in your mission here? Or how do they all balance each other out and harmonize here? I believe that in any person there is a religious spiritual dimension, and education needs to bring the dimension out that relates you to God [and this is the vertical dimension]. The social justice would be the horizontal dimension, relating the person to other people, especially those in need. So education would be a kind of help to become aware of these dimensions, the vertical and the horizontal. More about your personal background here, if you want to share any stories. How do you think you personally can contribute to this community building vision? I arrived only on February 7, 2017, so I am very much a newcomer, just a few months. I came to Mozambique in 2014, and before that I spent more than 20 years in Zimbabwe, a rural mission where I was a student chaplain. But personally it is my mission and my dream and desire to insert myself especially during my first year here, to learn Chichewa, and to give time to it. In my age, I’m not the youngest anymore, so it’s not so easy, but I like languages, and learning the local Chichewa language is a kind of door opener. It is such a difference to speak to the people in Portuguese, and it was the same thing in Zimbabwe, where I learned Shona. So every hour spent for Chichewa is of great benefit. Also the liturgy: I would love to come to a situation when I can celebrate freely in the Chichewa language, knowing the hymns, prayers, inviting others to pray, understanding their prayers, joining into their prayers…and I know it will take up to two years, and there will be moments of discouragement, but eventually I’ll get there. So learning the language is something. I have been visiting the surrounding villages, and as soon as I speak a bit better, it will have a positive impact on my speaking abilities. Why did you choose this line of work, and how did you end up at a school? You know the Jesuits a little bit—usually the provincial has an idea or a need so he might ask for your help. I told you I was a parish priest in Mozambique first, in Beira, and coming here for me was a total surprise. My predecessor was taken out of the job and taken to Rome to become a counselor, and then there was suddenly a gap, and it was not easy to fill it, so the provincial had to take that action [of placing me here]. My initial reaction was I couldn’t do the job, since I’m not trained as an educationalist. But in Zimbabwe I was responsible for eight years for the administration of schools, so it was not entirely new. I know what needs to be in place and I like having meetings, consulting, resolving issues together, to ask what is the best solution, so this kind of way of leadership helps me to get into the work and familiarize myself. Also now I am doing interviews with teachers to encourage them, to get to know them, and it will help me to better understand the Mozambican system of education, and we have right now appointed a young teacher as the director of pedagogy provisionally, and he has done very well so far. I am very aware as well of my shortcomings. So what are some of the challenges you have faced since you arrived that have caused you to reevaluate or improve your method of doing your job? The challenge we talked about—the language and culture, to open myself to that new situation. Another was to let go—I like giving retreats, to lead people through an intensive experience of prayers, for eight days, even 30 days, but I can’t do it right now because of the school and language—with Portuguese and Chichewa, there is kind of a difficulty. In pastoral work in the parish, I was very much involved in prayers, but now I am suddenly here at a school. So I need to let go of other things I really like to do. Another challenge is that all my friends and people I know are in Zimbabwe, some in Beira, some in Maputo, and I came here and I am by far the oldest member of the community. There are so many young people here…so these are some more personal challenges. But I have many moments of consolation and happiness in the community, and now more that the students are getting used to me and opening up, they appreciate my being present, and with the teachers I talk to there is more familiarity, and I think that will grow. Can you share some moments with me that have inspired you in the months you’ve been here? What has inspired me a lot is the presence of the volunteers as collaborators. Think of the way one volunteer is starting a garden. And his music can really motivate and animate. The other volunteer, a doctor, gives us a great service and opens our eyes to the medical needs of the place. I have been encouraged by the great efforts of my two brethren, Jesuits from Mozambique, and what inspires me a lot is nature, the silence of the place, the stillness, and going out for a walk. These are things I appreciate a lot. Do you have any more specific interactions with students, for example, that have inspired you and that you want to share? Students coming to the liturgy, where they would like to sing their own songs, and they help me to understand. Sometimes if you don’t know the language there are funny situations, but they can laugh and I can laugh and it becomes easy. So now to discuss the future and Mozambique as a whole country, based on Mozambique’s recent colonial past, with the colonial and civil war, how have these affected the political landscape, and more importantly for us, the education in the country? And if you have any ideas about how it specifically affected this community and region, you can speak to that. The little I know about it is that during the war, this whole region was almost empty of people. Most families had gone because they were afraid of the guerrilla fighters, from both groups fighting, the FRELIMO and RENAMO, so they went to Malawi, which is not far, and the whole place was almost empty. The Jesuits came very early to Mozambique but their efforts were cut, and who knows, it might happen again. If a war starts, we might have to move out here and close the whole place, and come back after 10 years…I hope not. But it has happened. There was a war here from 1965 to 1975, of 10 years, the colonial war, and many missionaries had to move out and abandon their missions. After that in 1976 or 1977, almost all of the schools run by the church were nationalized, and it was a big blow to the education system and the quality of it. And then in 1976 came the civil war, and it lasted until 1992, and during the 1980s there was hunger in Mozambique, turmoil, and people were leaving the country. Real poverty. In 1992, Mozambique was declared the poorest country in the world, right after the civil war ended in October 1992 with an agreement in Rome. That was an important moment, but it took a long time to recover. Now there are some good signs. The local currency, the metical, seems to be quite stable right now. There is more investment, and people trust. There is more dialogue between the parties, so we actually hope that we are on a good way, but in terms of political and social justice, we are still far from it. Many people who voted for the opposition have no way they can participate in the political process, and that is a big, big issue that hasn’t been addressed enough. Do you think ESIL is affected right now in any way by the past aside from being located in a region that was empty during the wars? I don’t think so, we are lucky to have the support of institutions from Spain, Portugal, and Italy; it’s a big help. They helped to start the structures, and we also want to set up more. If we relied only on the Mozambicans it couldn’t have this sort of development we have now. But having said that the support the Mozambican government is giving us is through the teachers and their salaries, which would be about $300,000 every year. So we want to also collaborate with them and make them proud, and it’s interesting to see that quite a number of the government employees and the education sector have already targeted ESIL to send their children here. So we have no problems to fill the school next year; there will be a lot of demand. Now that there is more demand, and it’s one of the first Jesuit schools, what do you think is the future of Jesuit education in Mozambique and also other Jesuit institutions in the country? 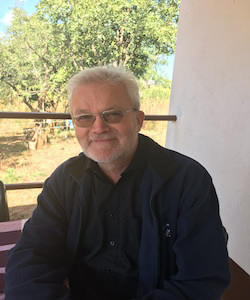 I feel very lucky to witness a situation where we move away from having expatriate Jesuits being in charge of projects, but more local Mozambican Jesuits who will take over and be in charge of schools and parishes; there are quite a number in the pipeline. I think the way the province is developing, there will be more internationality. One of our priorities is youth education, so I think from that point of view there is a future of ESIL. With regard to schools in Mozambique, we are trying now to redo the educational efforts in Beira to improve the school we are running there for the archdiocese, but also schools a bit outside Beira, to have a school system there, and in Maputo, God willing, we have a plot where possibly we can also build a school. That would be great. It’s 10 hectares. It’s not quite resolved yet, the property question there. But in Beira we have a place that could be turned into a day school, so we are hoping to do something in the next 10 years. ESIL would be the first, but we could continue that with Beira; there are ideas to upgrade the school we have there and renew the structures. A lot of it depends on whether the Mozambican Jesuits will remain with us, as some will decide to leave.